It was time for my second visit to the Academy within a month.Yelawolf had already started his supporting set when we entered the impressively full venue, his unmistakable quick fire nasal delivery floating to the back of the room. The Alabama MC's performative experience shone through as he whipped up the crowd in a way rarely achieved by those second on the bill. Lead album single 'Hard White (Up in the Club)' received a warm reception, as did a timely A capella rendition of his recent BET cypher appearance. Removing his vest to reveal a heavily tatooed torso (an action that was going to become somewhat of a theme as the evening progressed), Yela provided a menacing performance of personal favourite 'Pop Tha Trunk'. This was preceded by a bizarre interlude in which his DJ played a medley of The Doors, some Johnny Cash and then wrapped it up with some Eazy E. That aside, Catfish Billy left the crowd feeling strong anticipation for Radioactive (November 21st for those of you that are interested) Clocking in at nearly 45 minutes, the MC leaped from the stage for some crowd interaction for his final song. The future is looking bright for Shady Records signee. 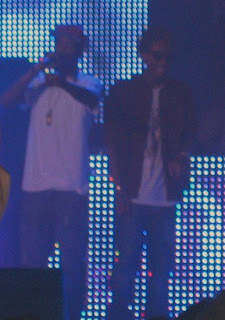 An impressively short 20 minutes later, Khalifa took to the stage. Sharply attired in a fitted plaid shirt, Wiz launched into a selection of the weed induced mixtape material that propelled him to internet stardom. A nod to his British audience resulted in a sample of Tinie Tempah's 'Till I'm Gone', along with a performance of new track 'Young, Wild and Free'. The rapper pranced spasmodically across the stage, contorting his body playfully into an all manner of interesting shapes. The crowd was treated to a demonstration of Khalifa's karate skills, and an unnecessarily enthusiastic sensual self-rubdown of his tiny frame as the Pittsburgh native energetically clowned his way through the performance. 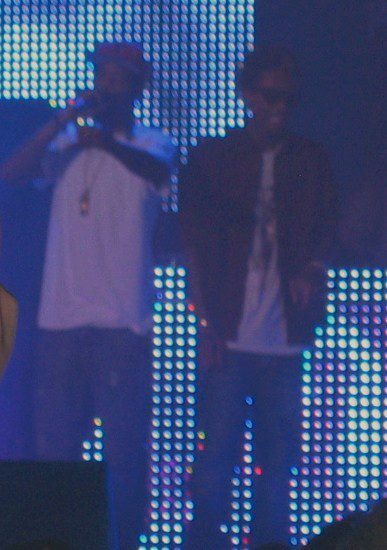 As a result, the backing track was often employed to provide musical support, filling in the gaps when Wiz was otherwise engaged. An uncharacteristically mundane interlude followed, Khalifa hammering home the point that we were all part of his 'Taylor Gang'. Members of his crew then flooded the stage, swathed in Taylor Gang memorabilia as a stomping performance of the song of the same name was performed. The track ended with the Wiz being 'shot down' by his light show, the rapper jerking his body in time with the gunfire. The second half of the gig was devoted to gold selling album 'Rolling Papers'. The more chilled out pop oriented tracks required less exuberance, so Khalifa took the opportunity to use the microphone stand to showcase his vocal range. Favourites such as 'No Sleep', 'Fly Solo' and drug ode 'On My Level' were performed with aplomb, the rapper stumbling across the stage in accordance with his lyrics. Single 'Roll Up' entered the set list as the performance wound towards the inevitable last song. The lights took on an appropriate hue as Wiz performed 'Black and Yellow', the song that propelled him to global stardom. He then ran off stage, his DJ coaxing him back for one last effort. 'Cameras' proved to be a suitable anthemic encore track, the crowd leaving the Academy with a definite buzz. In short, Wiz Khalifa showed Glasgow exactly why he is regarded as one of hip hop's most charismatic new stars.